Olive Dragonfly: Twin baby prep! Along with the obvious unpacking, organising, decorating and sorting that goes along with moving into a new home, I have also been working my way through the 'twin list'. We've now ordered the Bugaboo (a very generous gift from my in-laws), the cots, the co-sleeper (recommended by a few twin mums but it's £295! We bought ours second hand on ebay for just £80 barely used and it's fully washable. ), the bean bags (as recommended by Roz and I found a 10% off code! 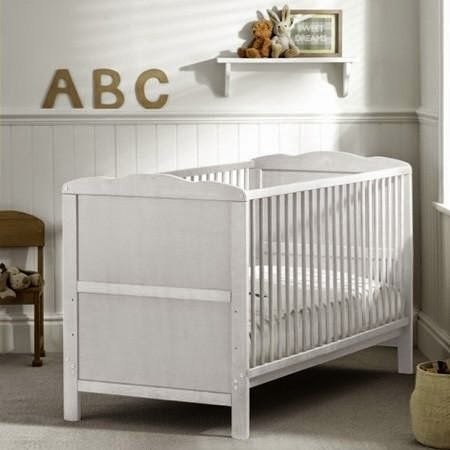 ), various bits for the nursery, LOTS of Ikea flat-pack (which Mum mostly built) and we're currently researching baby carriers and breast pumps. (Any advice on these would be very gratefully received - I had seen the Medela Freestyle double recommended for twin mums but it's pretty pricy. Anyone have any experience of electric pumps? I'm now thinking about the Medela Swing as recommended by Zoe and Roz. Our gorgeous rucomfy baby beanbags! Baby wearing options are proving to be a difficult one - there is just SO much choice out there!! Slings vs carriers - we'd want one each so we can go for walks together without the pram (particularly down the little woodland lanes nearby) and if they can be worn front and back, it gives me the option of wearing both babies at once if required when they're a bit older. I've also seen slings worn with a baby on each hip which might work better so straps aren't getting crossed over and confused while avoiding crushing any baby parts on front and back! 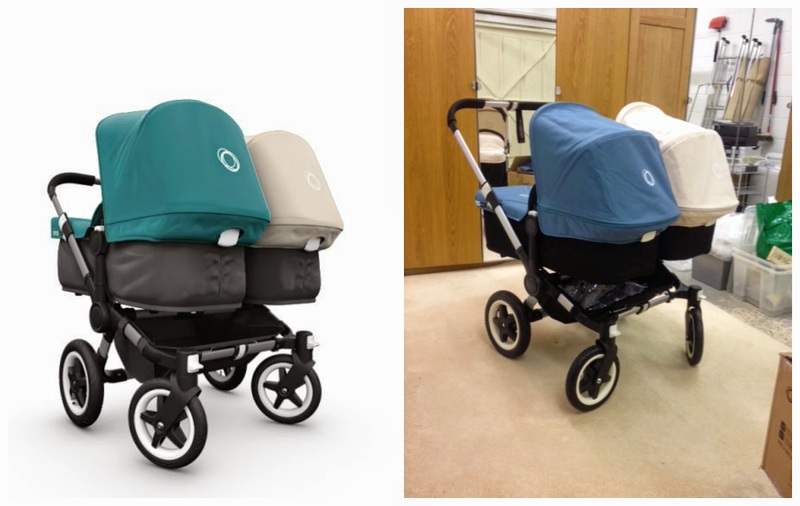 Image on left from Bugaboo website, on right - our real life bugaboo. Now we're just hoping we can return the original fabrics to the shop for a refund as they haven't actually been used and have folded nicely back into the boxes. (They're sold separately elsewhere but we were given a price for the whole twin set up so we're not sure if we can return them.) If not, we'll just sell them on ebay. Anyway, as for the babies themselves, they seem to be blissfully unaware, kicking away frequently which is just as well as it's now been 8 weeks rather than 4 since our last scan so I have no idea if they are still growing well, at least I know they're alive in there with all the squirming! SO many people keep commenting on how 'neat' I am and you'd never know there's 2 in there, etc that I'm getting a bit paranoid that they're too small and not growing the same as before. I'll be glad when we see them again tomorrow afternoon! We missed a scan due to the move and scheduling them down here is a bit trickier as ultrasound seems to be very busy. I've now met my local midwife, had my booking in appointment all over again at our new hospital (more bloods, urine and lots of the same forms basically), the 'twin midwife' at the hospital who will see us at all our appointments there and we'll meet the twin consultant on Monday at our next appointment where we'll all plan the birth! Eeek! Only 6 weeks to go now, unless the babies have other plans and come early!! I'll either be induced or have a c-section at 37/38 weeks unless there are any problems before then. Oh and I found out that even if I can have a natural birth, I can't have a water birth (which I always wanted) or use the pool at all since they need to monitor the babies closely from the beginning. :( Obviously we'll do whatever's safest and needs to be done but I was a bit disappointed. It might end up needing to be a section anyway. Love the beanbags with built-in Y fronts! That colour doesn't look like the petrol blue at all does it; I'm sure I've seen it in JL and it looks a lot more teal, do you think they've maybe sent ice blue instead? If not, I was considering getting it for baby girl but not if its that blue, will need to go back and have a look. We've got a baby bjorn carrier that we had for H but im considering the new ergo one as it can now carry baby facing outwards which Holden loved on the bjorn but the older ergo doesn't have. Pump wise I've got a philips avent electric one too; started with the manual but it was too much work! I agree with the lansinoh breast pads too, more expensive but far superior to any other ones. I leaked a lot and any others were awful.